Here again, I’m odd man out. 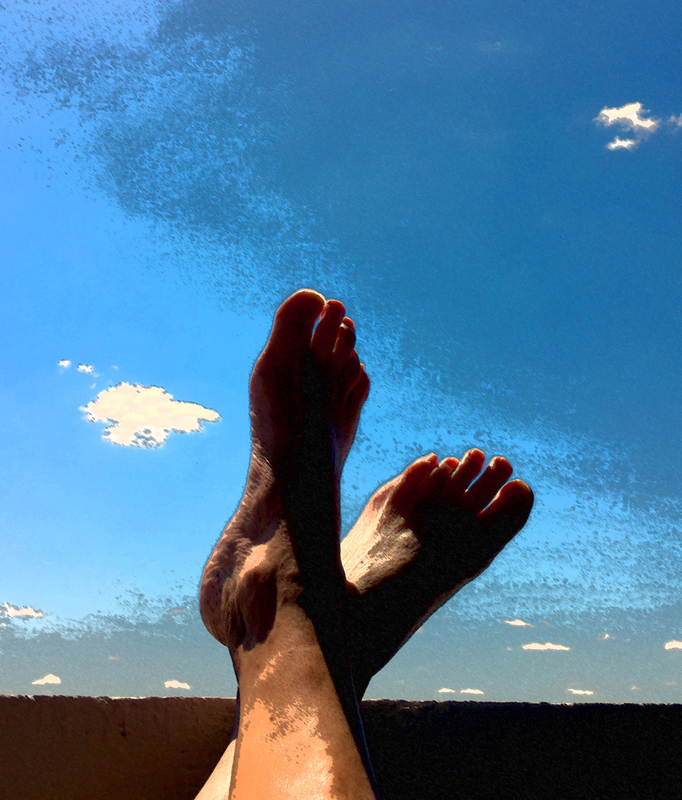 I want my feet up there, in the clouds. As often as I can manage, I step out on the balcony, hoist those babies onto the railing, and let the breeze caress my toes. It’s sweet, sweet relief. My feet, you see, pay a heavy price in times of psychological distress. 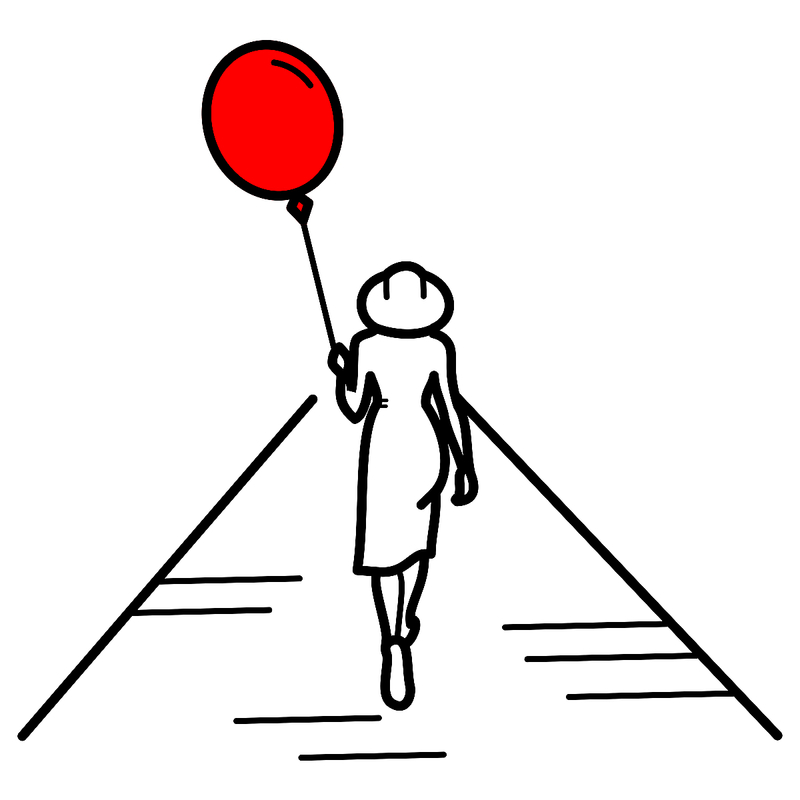 I hit the street when my mind’s in turmoil, and I walk. In the last month alone, I’ve logged 9,000 miles, give or take, and my feet are absolutely killing me. In addition to falling arches and strained ligaments, I‘m flirting with shin splints and a hip pointer injury, plus a hamstring pull. The heels of my shoes are so worn down, I’m hiking around on bare socks. Hell, I’m the new Forrest Gump, doing my best to outrun grim reality. A perfect storm of epiphanies and confrontations and stoopidity blew in recently and delivered a good, old-fashioned gobsmacking. The epiphany, of course, came first and it came by way of google. You know how you start a search, but one thing leads to another until you realize you’ve wandered way far afield? Well, that’s what I did, I wandered right into a propeller. A propeller with my new name on it: Highly Sensitive. Ugh, sensitive, there’s a wussy label for you. For eons, I’ve whined about not being wired right and guess what. I was dead on, I’m nowhere close to wired correctly. I have a ‘sensory processing sensitivity’, which is a fancy way of saying I’m acutely, woefully thin-skinned. But the good news is, I’m not crazy and I’m not alone. This isn’t a disorder or a condition, it’s a personality trait shared by 20 percent of the population. We’re born this way. We are, God help us, Highly Sensitive Persons. To make matters worse, I, personally, lack any form of emotional intelligence. I’ve no defenses, no coping skills, no discernment, no nothing. I’m a sitting duck. What I do have, though, is humor. Funny is my greatest ally and staunchest protector. Yet, even that deserts me in times of duress. Bullies don’t scare me. Neither do loudmouths or pompous blowhards. It’s the people I have genuine affection for who terrify me. They can open an artery with a stray potshot or a withering glare. Confrontations are scorching, scathing events; I’d rather take on a flamethrower. Still, I don’t fight back, I leave. I walk away, tail between my legs, and disappear into my own head. Then I spend weeks dwelling and overthinking and nitpicking and making mountains out of molehills. It’s what I do. All of this, the emotional cluelessness and acute sensitivity, should’ve been dealt with decades ago. But, to be honest, it’s a can of worms I never, ever wanted to open. But now it is and I’m trying awful hard to run away, put some distance between myself and reality. What reality, you wonder. The relentless one I keep banging my head against: Life is all fun and games until someone gets hurt — and the someone is usually me. Please send tourniquets and splints and a road map. Wow these experiences and thoughts you’ve written about, I’ve had them as well and it’s as if this whole post came from my head except it didn’t. That’s how weirdly relatable it is. Also, walking is also a necessity for me. It really does make decision making and reflection easier. Who knows how many miles we’d go if we actually walked together? All I can say, as one highly sensitive person to another, it’s tough being a sponge. It’s important to try to figure out ways to wring ourselves out once in a while. I feel this so deeply… I also am not scared of bullies. I’m more anxious about people who are close to me. 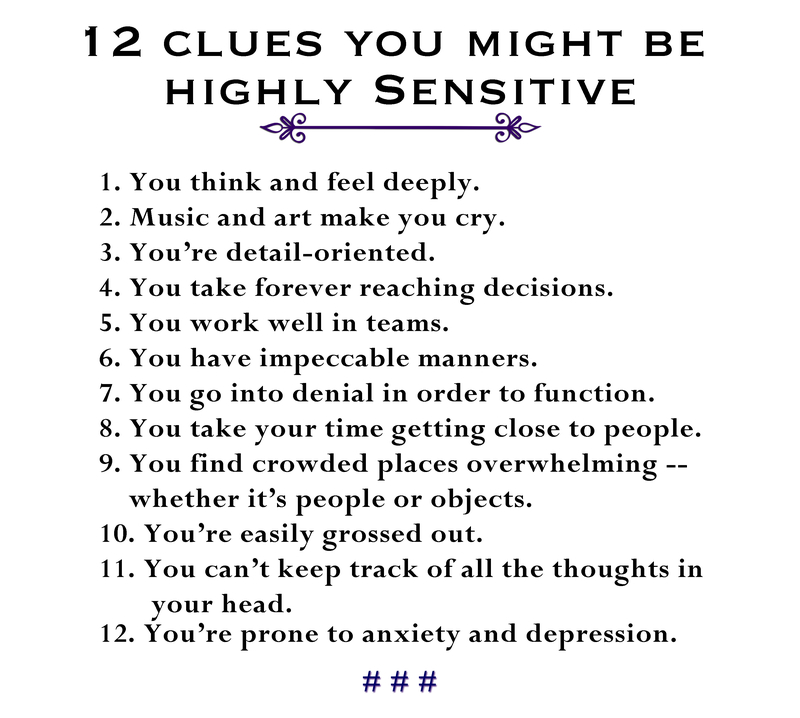 Based on your list, I have a quite high sensitivity, which I’ve always known. I didn’t check every single thing but a lot of it, yeah. My instinct is flight but it’s as harmful as fighting all the time. The wear and tear just takes longer and the effects are more gradual, but it’s as severe as if I were a seasoned fighter. I guess balance is key. How I hope you’re right. But you know what I was wondering? Where’s the scar tissue? I should have loads of scar tissue and be tough as nails by now. What’s the deal? You’ll always be funny. It’s what you’re made of. Just need to shake that bad stuff off the way dogs do.